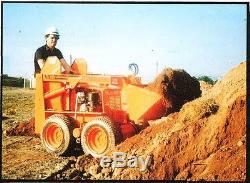 DRAWINGS FOR SKID STEER LOADER. 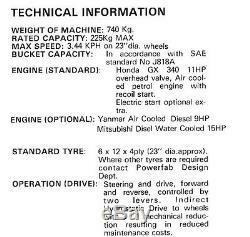 These machines have been made since the 1990's and are still in use (google powerfab loader) the design has proven that they are reliable, robust and versatile machines. This loader is less than 750kg and can be towed on its own removable suspension axles behind a car or van. It has many attachments including earth drills, grapples, forks, brush, digging arm and loading buckets. Hire and rental companies like them as you can quickly get back the costs of the machine. The drawings of the machine will be supplied electronically and in pdf format as well as dxf format which will enable a cnc machine to read them and cut out the plate efficiently making it easy to order The off the shelf parts like hydraulic cylinders are easy to source from our list and. As a kit you would be able to assemble within a couple of days. This advert is for the building of just one machine. The video shows the machine in action. If you do not accept this liability, do not build this towable backhoe. There is no technical assistance with these plans. These plans are for informational purposes only and do not purport to cover all details or variations in design, nor provide for every possible contingency to be met during constructions or operations. Should problems arise that are not covered in these plans or further assistance be needed, purchaser should seek professional help. The item "BUILD OWN POWERFAB SKID STEER LOADER BACKHOE DRAWINGS / PLANS" is in sale since Thursday, December 22, 2016. 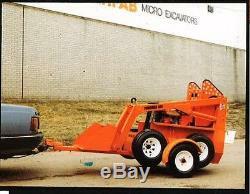 This item is in the category "Industrial\Heavy Machinery\Skid Steer Loaders". The seller is "power-fab" and is located in Swansea. This item can be shipped worldwide.